It's hard to know what was more perplexing. 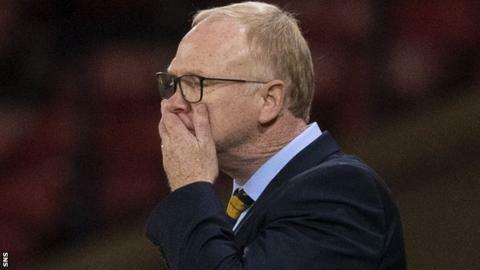 Alex McLeish's comments before Friday night's sobering experience against Belgium, or his comments after the visitors had finished turning the atmosphere at sparsely-populated Hampden from something akin to a library to something more in tune with a morgue. In his pre-match programme notes, the Scotland manager said he intended to leave the national stadium having proven that his team can go "toe to toe" at this level. Later, once the dust had settled on the 4-0 loss, McLeish argued that he could count on two fingers the number of times Belgium had cut open his side. Whatever McLeish was seeing was not grounded in any kind of reality. Thinking that Scotland are capable of playing Belgium, third at the World Cup, at their own game was a strange notion from such an experienced manager, but saying that they had only sliced his team apart on two occasions was demonstrably untrue. As assessments go, it was as wide of the mark as some of the kamikaze stuff that contributed to Scotland's heavy defeat. McLeish is due some sympathy, not for his words, but for the fixture schedule that was presented to him. His team has scored one goal and has lost four of the five matches they've played, but the choice of opposition has not been kind. The Scottish FA are mired in poor decision-making right now. Or, in the case of where they are going to play their games in the future, non-decision making. McLeish put a brave face on the mad trek to Peru and Mexico to play two nations who were in the final stages of preparing for the World Cup, but that was an ordeal that the manager could have done without. Then came Belgium. An over-priced fixture for a start. And not at Tynecastle, Easter Road or Pittodrie, where the 20,000 crowd would have guaranteed a terrific atmosphere. No. Hampden was a soulless place to be on Friday night. Another poor call. McLeish said the Belgians were the ideal opponent, a team that he wanted to go up against, but you wonder about that. With his team struggling for momentum and goals, Scotland could have done with a match that would have given them a decent chance of a win rather than running the risk of a confidence-sapping hiding at the hands of one of the most pre-eminent football nations on the planet. The Scottish FA say that nothing could be done. All the lesser nations were unavailable. The upshot is that McLeish is now having to pick his players up from the floor and prepare them for the first truly important match since his return to the Scotland post. The big picture here is not Belgium in a Friday night friendly; it's Albania in a Monday night Nations League match. It's a game Scotland must win if they are to harbour any hopes of taking advantage of the new back-door route into Euro 2020. Going into it on the back of an error-ridden chasing is only going to make the next few days more stressful. Albania are 24 places below Scotland in Fifa's world rankings. In the last year or so they have been beaten 3-0 and 4-1 in friendlies by Kosovo and Ukraine. They also lost a World Cup qualifier 3-0 at home to Israel. That's one side of the ledger. The other side is quite instructive. Having shipped that heavy competitive loss at home, they did precisely the same thing to Israel away, winning 3-0. They beat them again on Friday in the opening fixture of the Nations League. In November, they went to Turkey and won 3-2. In October, in a World Cup qualifier, they lost 1-0 to an Italian side featuring Gianluigi Buffon, Giorgio Chiellini, Leonardo Bonucci - all Juventus at the time - Inter Milan's Antonio Candreva, Napoli's Lorenzo Insigne and Lazio's Ciro Immobile. Their form line gives you the impression that they are exactly the type of lower-ranking team that tend to come to Hampden and frustrate the life out of Scotland. The side that beat Israel on Friday had players - and regular starters - from Lazio, Napoli, Atalanta and Empoli in Serie A, one from Malmo, one from Basel and another from Aris Thessaloniki. They are eminently beatable, but they also look capable of frustrating Scotland if Scotland aren't at it. In Christian Panucci, they have an Italian manager who knows all about Hampden and McLeish. In the final qualifying game for Euro 2008, Panucci wasn't just in the Italy side that came to Glasgow and beat McLeish's team 2-1. He scored the winner - and it was controversial. That was an excellent Scotland campaign in the company of Italy and France and a decent Ukraine side, and yet eight wins from 12 matches still wasn't good enough. Qualification was harder then. Much harder. Nowadays the doors are wide open to the Scotlands if the Scotlands can only put one foot in front of the other and walk right on through. Albania is the first critical test of how sure-footed they are under McLeish. A win would brighten the sky above the manager's head - and it's in need of brightening. At close to their best, they ought to be good enough. There are some fine players in this Scotland side, but the time has come to show it. Fighting talk about application and progress is utterly meaningless. Talking for talking sake has long since bored the ears off everybody. 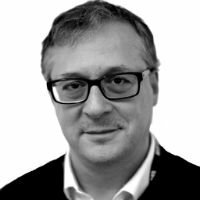 Anything other than a win would not just land a massive blow to Scotland's Nations League aspirations, it would also render the entire national stadium debate as a bit of a joke. If Scotland can't find a way of getting past Albania at home then it's not a 50,000-seat stadium at Hampden or a 67,000-seat stadium at Murrayfield that they'll need, it's something a touch more modest and in keeping with a team with a rapidly diminishing support. Friday was a wounding night, but Monday is when McLeish and his team have to get it right.